Owners and operators, Matt and Cherice Ferree began collecting horror inspired memorabilia in the early 2000s and decide to begin their own take on the industry when they found a lack of horror-inspired kitchenware. In order to keep their horror memorabilia hobby alive, they began to buy collectibles in bulk in order to sell a portion of the pieces. This transition created Terror Toys as an online horror memorabilia shop in 2014. In October 2018, Terror Toys transitioned their inventory to their current shop on McCulloch Blvd. Due to an unforeseen increase in foot traffic, the business has now transitioned to 90% brick-and-mortar and 10% of revenue from online sales. Listen as Matt discusses the logistics of horror memorabilia industry and how his personal passion transformed into Lake Havasu’s first and only horror collectible shop. Matt Ferree grew up in Scottsdale, Arizona and moved to Lake Havasu in 1999. After high school he moved to Phoenix and worked in sales, concert security, and electronics repair. After college, he returned to Lake Havasu where he met his future wife, Cherice. The two connected on their love for Horror movies and related memorabilia. Over the years, their collection grew to create a macabre house. As their dark decor enveloped their house, they realized that their kitchen was bare of the same ghoulish flare as the rest of the house. Upon their search for creepy kitchenware, they found there was much of a market for it besides goods that were cheap and tacky. Matt decided to end his long searching by creating his own line of Horror-inspired Kitchenware. There, Terror Toys was born. As the only Bowling Alley in town, the lanes have seen many strikes, laughs, and competitive spirits. Let the nostalgia come alive with a (literal) behind-the-lanes look at the operations of Havasu Lanes. Tour will be led by an actual bowling lanes mechanic ready to answer any questions on ball return, pin retrieval, and just how all the magic of bowling nights really work! Tour is limited to 10 participants, no fee, please wear closed toe, non-heeled shoes. If you can't make the tour, join us at 6PM for a game of bowling. Winning team will receive a SPECIAL prize. Ever wondered how your packaged foods and goods are created? On these monstrosities of incredible machines! Come explore the engineering of printing with us and Arizona Flexible Packaging. Arizona Flexible Packaging is a Flexographic Printer & Converting Company committed to providing quality packaging to meet customer expectations and requirements in a highly competitive market. We are a family owned company that specializes in producing superior quality flexible packaging since 1998. Our customer focus, quality systems, skilled team, and food safe operations enable us to achieve a wide variety of flexible packaging solutions for customers nationwide. As a progressive corporation we envision being a leader in the flexible packaging industry known for our efficiency, quality, and strong, long lasting relationships with our customers. Arizona Flexible Packaging is a Safe Quality Food certified facility committed to providing safe, quality products and to further improve our abilities to achieve it by maintaining an internationally recognized HACCP-based Food Safety and Quality Management System. For this reason all guests are required to follow good manufacturing practices to prevent food safety hazards. Beyond the programming, the impact of an event is greatly influenced by the ambiance and relating aesthetics. Learn how to creatively express the message of your event with Posh Planning owner, Nichole Burnett. From large scale decisions like venue selection and entertainment to the most minute details like tablescape and technology, Nichole will explain how the little details combine to create a memorable experience for guests of any event type. Explore the latest design trends in event planning, and even how to plan on a budget. Nichole will bring concepts, tips & tricks, and even live examples to help make an event one for the books! Nichole Burnett is Owner, Lead Planner and Event Coordinator at Posh Planning & Event Co. She is also the Venue Manager and Wedding Planner at Havasu Springs Resort. She loves every excuse to throw a fun and unique party. After graduating from U of A with her BS in Public Admin and an emphasis in Criminal Justice she had every intention of going to law school and becoming a badass lawyer, but she craved more creativity and didn’t want the normal 9 to 5 grind. Fast forward 7 years you can now find her planning weddings and events like a boss. When she isn’t designing beautifully unique events you can find her spending time with her husband, Michael, and their two dogs and cat. Let's screen print together! 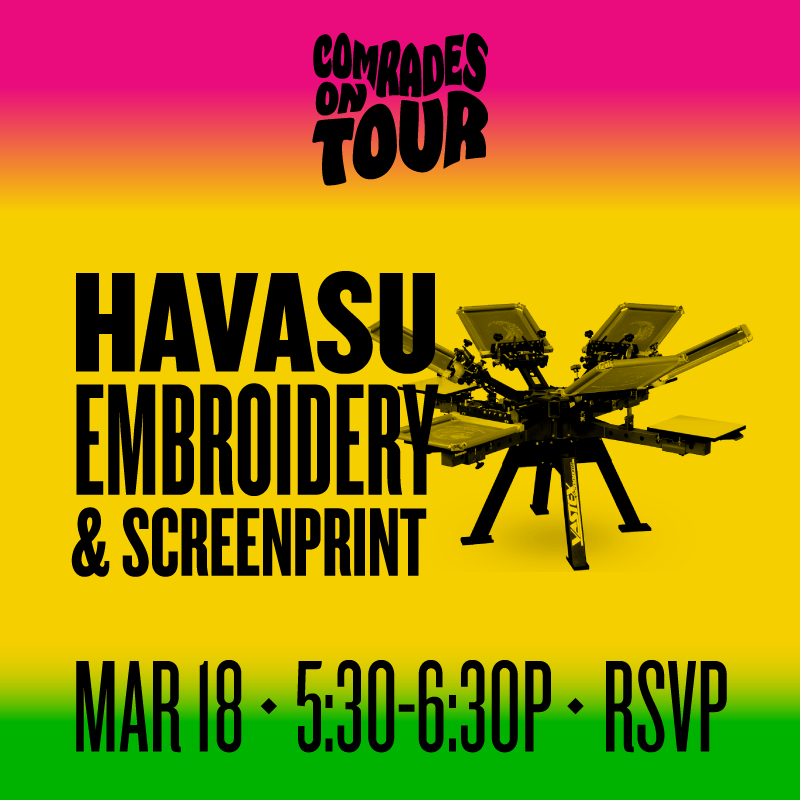 March's On Tour is hosted by Havasu Embroidery and Screen Printing. Nic and Chris will give us a personalized tour of their facility. PLUS PRINT YOUR OWN COMRADES SHIRT! Yep, we're getting our hands dirty on their printing presses, and they've generously offered to let each attendee take one home. Leadership is an innate skill that can be honed and polished at any point in one’s career, personal goals, and relationships. Dustin will layout just what it takes to lead in all areas of today’s society through simple models and systems that he has developed in the past 12 years as a successful leader. Learn about “Climate System”, an explanation of the environment needed to perform at the optimal level. Learn real-life, practical application tools to cultivate positive changes needed to take on and sustain in a leadership role. Art Untangled is a fun workshop to unravel the mysteries of making your own art. 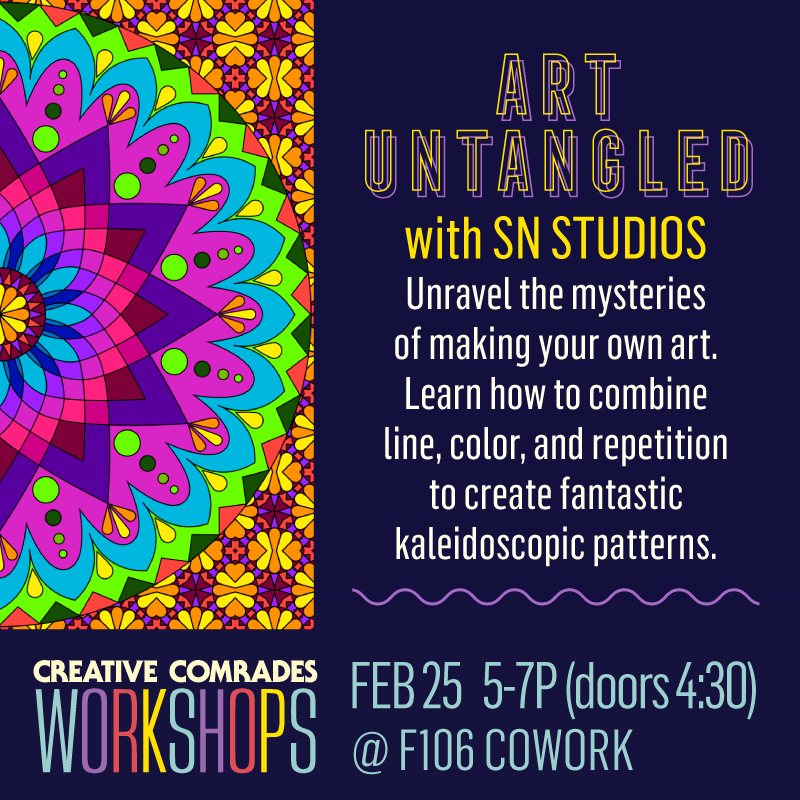 You will learn how to combine line, color, and repetition to create fantastic kaleidoscopic patterns. Participants will be provided with supplies or bring your own favorite sketchbook, pens , markers, and/or color pencils. Hosted by the awesome Sam Nelson of SN Studios! Doors open at 4:30, fun starts at 5 and will go till 7. A business sign not only flags a location but simultaneously creates a first impression that leaves a lasting brand familiarity. Be visually compelled by the inner workings of sign creation at the only locally owned and operated sign manufacturing company in town, Mack Signs. Come along and become familiar with every stellar step in the process from design, printing, and fabrication. *P.S. There are some rad projects underway in the shop as we speak; you’ll definitely want to check it out. For February, Creative Comrades will be discussing the importance art education has on the schools as well as its community impact. There are many unexpected benefits of a well-rounded art program beyond the education of basic art skills. Data in-part with personal student accounts represent the impact art education has on both the individual and the community as a whole. Hannah Upton is the art educator at Thunderbolt Middle School. She graduated from NAU with a Bachelors of Science in Education with an emphasis in Art Education. She is currently in her fifth year of teaching in Lake Havasu Unified School district with her first four years focused on elementary art education. At the middle school level, Hannah teaches with a project-based curriculum in which students actively participate in the creative process while learning specific art skills and techniques. After school, she facilitates the bi-weekly Art Club that conceptualizes ways to beautify the school and community. You may know them from any of their epic parties or the ONLY ORCHIDS facebook group. Behind the scenes they're devising plans and action to help youth, citizens and the community of Lake Havasu as a whole. "We give when we want, to who we want, whenever we want, as much as we want, with no apologies. We strive to be the most relentless group of givers we can possibly be, while having fun. We combine party with giving back." They remove the politics from giving, but how do you actually do that? Get an inside look into starting your own charity or non profit. What does it look like behind the scenes? What drives their mission? How do you top the last event and touch even more lives? Creative Comrades is a monthly meet up for all entrepreneurs and creative professionals in Lake Havasu. Make gifts at our maker stations, shop from featured artists, plus more! November's presentation highlights two important lessons learned from decades of management and scientific experience that continue to be overlooked by most leaders. Drawathon - Donate $20 and get art! Donate $20+ and get art!